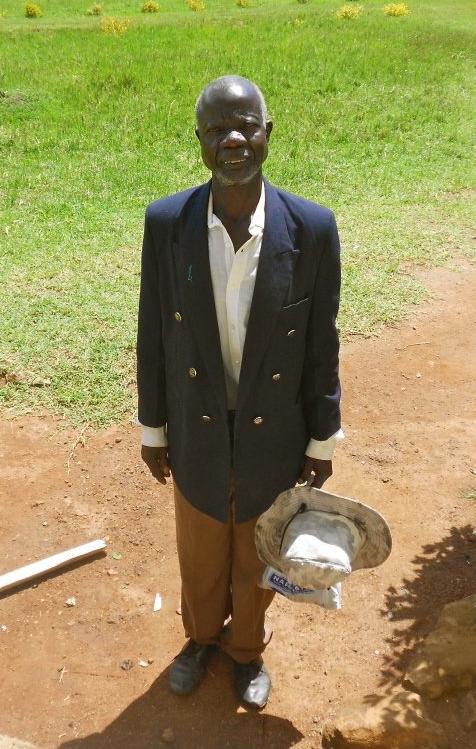 Here is a WONDERFUL story, thanks to your contributions to our "medical fund". Actually it is "The Rest of the Story"! You may remember the photos we sent of Christine. She is the beautiful young mother in her twenties, who had a huge keloid on the side of her face. When we saw her we asked if she could be helped. The answer was yes. We authorized Hesbone to use whatever money was needed to take care of the surgery. We knew that she had been through the surgery; we had before and after photos, but we didn't know the full story until we came this time. It seems that keloids will not grow back if they are treated by radiotherapy (radiation therapy) within a short period after surgery. The surgery and radiotherapy procedure could only be done in Nairobi; about 250 miles away - but many hours by auto, or more by bus. Christine is a village girl, and has little education! She has never been to Nairobi (wouldn't even know how to get there) and she's probably never been farther than Kisumu. She knew no one in Nairobi. But Hesbone and Violet made all of the multitude of arrangements for her to go and all the arrangements for the procedures. Hesbone's brother and wife took her into their home and cared for her the whole time, and saw to it that she got where she needed to go for each step of the process. We have come to know and love Christine and have heard her tale first hand. As she tells of her miracle - that's what she calls it, and she's correct - she lights up. She positively glows as the tears of joy fall down her lovely face. But first, some background. 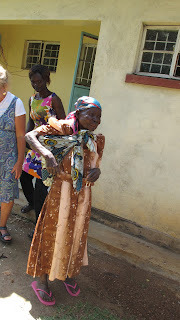 Christine was truly disfigured and in her culture many consider that to be a curse. She told us that people would actually say to her, in a mean, hateful way, "You are going to die and we will be at your funeral"! 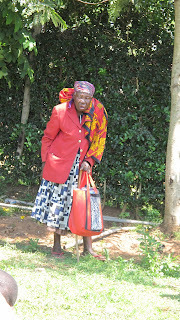 When she would go to market they would point at her and make fun of her and call her names. Her husband had left her because she was ugly, and she was left with 3 children to raise herself. But, what's more, this growth weighed a lot and it was hard for her to hold her head up. Additionally it was very painful and gave her tremendous, continual headaches. Eventually she couldn't stay awake because of the effects it was having on her whole system. She would sleep almost 24 hours a day and couldn't take care of her home or her children. It is hard to write some things without crying - this is one of them. So, one day she "just happened" to be where we were and we saw her. That is just the way God works. Questions were asked, wheels were set in motion, and Christine's life was changed! How wonderful! Her husband has returned and he went to the church and stood in front thanking them for what they had done; amazed that they would do that for Christine. She continues to regain strength and says over and over that she wants to serve the Lord in return for what He has done for her. She just keeps praising Him and saying how much she loves Him. She is amazed at His love for her! She is very, very happy! She is healthy and well! Although, she complains that as of yet she is only strong enough to carry 20 litres (5.28 US gallons) on her head! Yes! We saw her lift big tubs of water and carry them about a half mile on her head! She came over to the farm regularly while we were there to cook for the workers and to help in general. What a servant's heart she has! We truly thank all of you who make these im-possible things become possible! We are blessed to witness them first-hand, but hope you can vicariously ex-perience them as we try to communicate to you about them. Below is a photo of a dear man, Mariko, who has been diagnosed with prostate cancer. He has gone to the hospital for evaluation and we await the plan of action for his treatment. Additionally one of the children in Magwar is suffering from seizures. He has been sent for an MRI and the beginning of the diagnosis process. He is being seen by neurologists. Mariko - he dressed up for the photo! THE MATTRESS AND BLANKET SURPRISE! More reason for tears of joy! We have been in many homes here in Kadawa, and have noticed that most people sleep on reed mats on the floor. 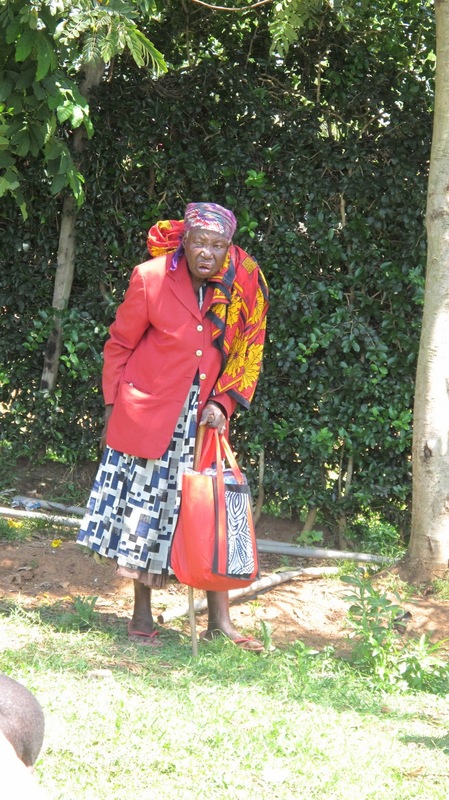 We developed this strong conviction that old ladies should not have to sleep on the floor. Their old, tired bones should be able to rest on a mattress!! We shared our vision to get mattresses for all of the destitute widows with some, and a friend contacted us saying that she would sponsor the entire lot! We went mattress shopping and were able to get a volume discount at a local manufacturer. We aren't talking "Beauty Rest, or Sealy Posture-Pedic" here. The mattresses used in Kenya - even where we stay - are a foam; they come is soft medium and hard and in a few different "densities" - whatever that means. But we found some substantial ones that will last a long time and not go flat after a few weeks. We got 24 at 2860 KES each (about $28.60 or £19). 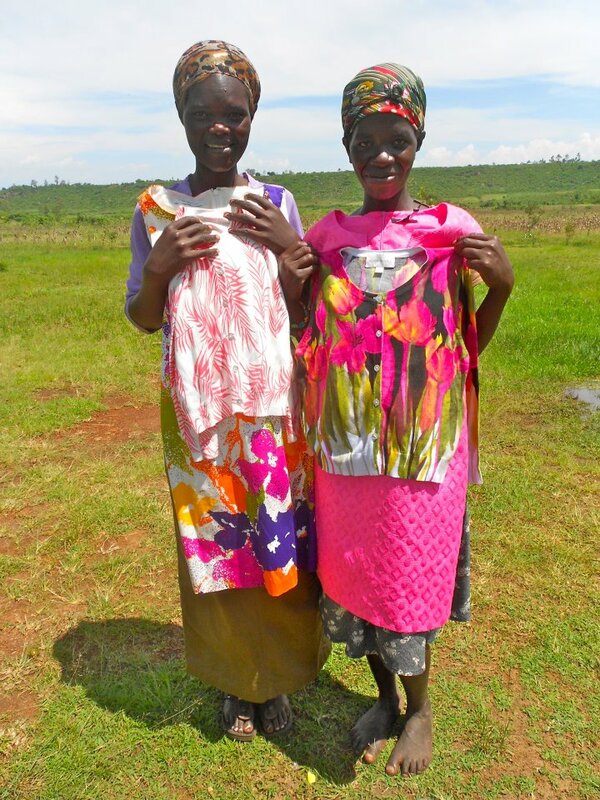 We also bought them blankets - it gets cold at night at Kadawa's altitude. Some other lady friends sent some tote bags and flip-flops which we distributed at the same time as the mattresses. There were exactly the number of flip-flops to fit the ladies. Hesbone notified the widows to come to the church - but we didn't know that he hadn't told them exactly why they were coming. There are several reasons for that - not all apparent to us - but one reason was just to surprise these ladies. And that they were, indeed! An aside: It is interesting to us that whenever they come to the church they will put on their best clothes. When they all got there he explained to them what was happening. The only problem with not telling them in advance was that 90 percent didn't have anyone to help them to carry the mattresses. What a scene! These women were so happy and excited! You should have seen them. 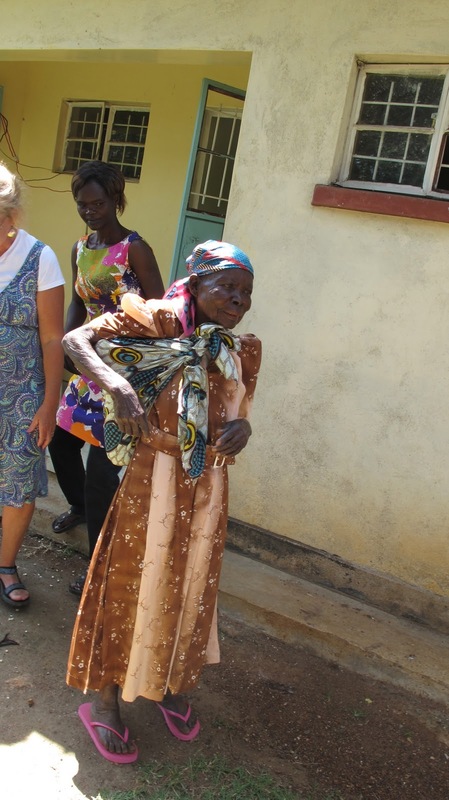 They went around to the back of the church to get their mattresses and blankets after they had been given the tote bags and flip-flops A Luo woman almost always has a leso with her (a large 3X5 piece of material that has multiple uses). Here was a wonderful example of their use. This one little, itty-bitty lady put her blanket, bag, and flip-flops in her leso and tied it to her back so she could take her mattress (see photo). Lorna didn't get a mattress (she was given one by a visitor last year) but she did get a blanket. Our friends Anna and Maggie were there and Maggie took a couple of photos of Lorna with her blanket. Marty watched as she showed Lorna her photos in the camera. Lorna cracked up. She laughed so hard and hugged Maggie and laughed more and looked more. Marty just stood there crying because a year ago Lorna couldn't have seen any of that - she was blind! There she was, happy and laughing and holding on to her blanket and praising God for it. This was such a major and powerful thing to happen to and for these women. We had no idea of the impact it would make! Later on Hesbone said to us that he wished we could have understood what these women were saying. A couple of other people told us things as well. Some of the women were just stunned and didn't speak at all because they were overwhelmed. Others said that they never would even have thought that they would receive a mattress like that "in their lifetime". One was just leaving when she turned around, came back to the group and in front of us all began to tell God just how wonderful He was and how thankful she was for what He had done. When Hesbone tried to get some to wait until later so that someone could come carry it for them they told him that it was their very own mattress and they wouldn't let anyone else carry it - they wanted to carry it themselves. 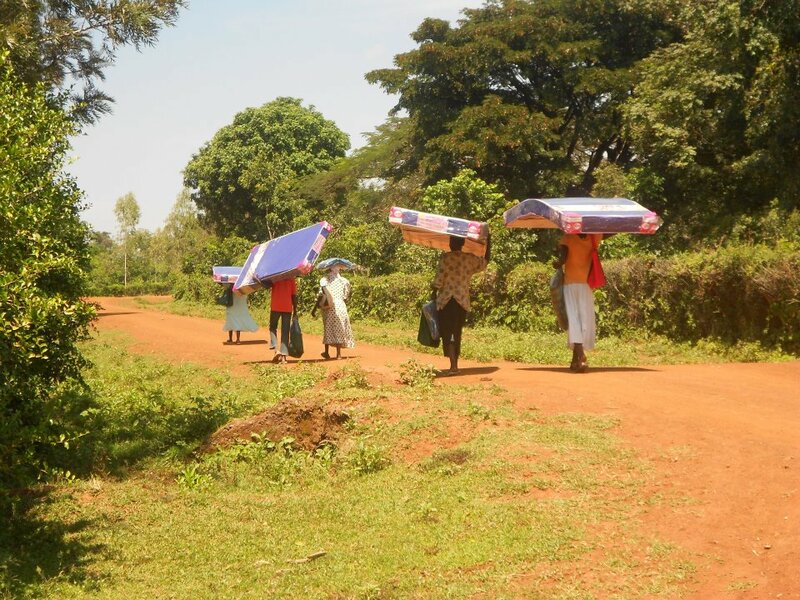 We will ever forget the picture of them walking down that dirt road from the church - in both directions - all in a line - carrying their mattresses (see photos). Some walked with a walking stick in one hand and balancing their mattress on their head with the other. What a witness to the village. Here were all of these women walking through the village with their mattresses on their heads for everyone to see! and wearing her new pink flip-flops! not letting her mattress out of sight! Another lovely thing - there was an old man there, a member of the church - who takes care of the hedges that entwine the fence. He does it because it gives him a sense of purpose; he's very old and bent over due to some injuries that were never treated. He is always barefooted. He saw the women getting flip-flops and asked Marty and Maggie if he could have a pair (through sign language mostly, since we only understand a very little bit of Dholuo). We looked at his feet and saw that the toes on one foot were very short and webbed. Flip-flops wouldn't have worked for him. Now here is the neat part. (we are sure you will realize that there is no personal horn tooting here). Marty had a pair of Crocs (casual rubber shoes) on that she was going to put in the barn to use them next year. She gave them to him. They actually fit pretty well. He was so very excited! Later on we found out that He had been asking the Lord for shoes for a long time and he had been reminding Him that day that he needed shoes badly. Also he was praising God for providing him with such a wonderful pair of shoes; such as he would never have thought of receiving. It is mind-boggling that a person could be so happy and excited over a pair of used rubber shoes. Oh dear! No - we aren't talking about a supernaturally gifted goat that can fly a plane! We have a pilot-project going in Narok - the town we visited when we went to Maasailand. We have invested some money in goats with the goal of realizing a profit to put into the development/operation of The Widows Farm. If it proves to be good business we will continue next year. Our goats with their shepherd! Maasai are herders. 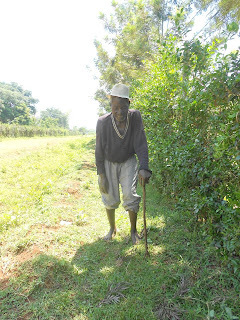 Their wealth and status is in their livestock - cows, sheep, goats - their wives and children. Maasai are especially fond of goat for their Christmas celebration meal. At Christmas time a goat will sell for a great amount of money - especially Christmas Eve. 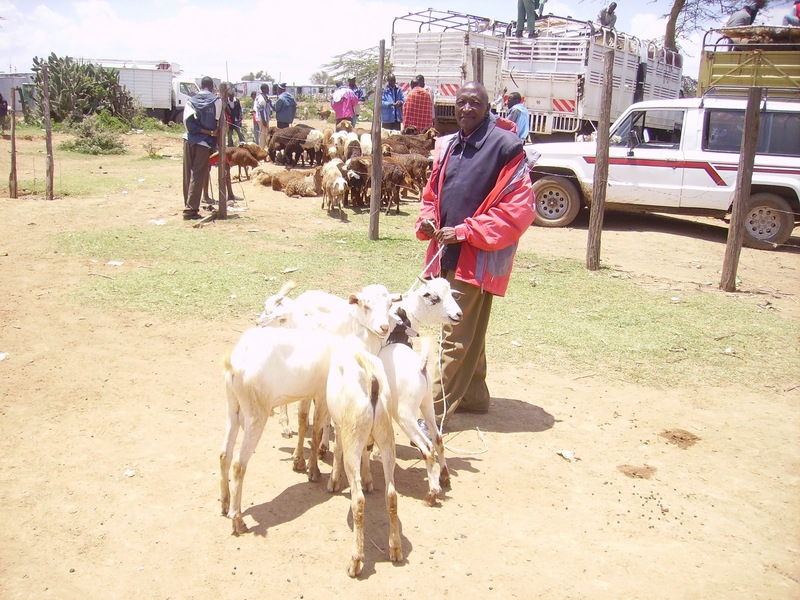 On the other hand, at the beginning of the school year many goats are sold to pay for school fees, so the market is full and a goat can be purchased for a relatively small fee. These are not comparable to the goats we buy in Kadawa. It is a different breed and size goat and an entirely different market. In August we purchased four goats for 12000 KES. We will sell them in December, near Christmas, and can get up to 12000 each for them. The cost for feeding and veterinarian fees (inoculations, etc.) is 500 KES per month. Marty prefers not to name the goats as knowing their ultimate fate she does not want to get the least bit personal with them. We Bless You All and Thank You All for Your Prayers, Your Love and All of Your Support! We are in the UK now taking care of administrative tasks and medical appointments and will be going to the US the 25th of October, initially for more of the same. The next letter should be out in two or three weeks. Life will be slowing down a bit more by then. Let us hear from you - we really enjoy feed back.